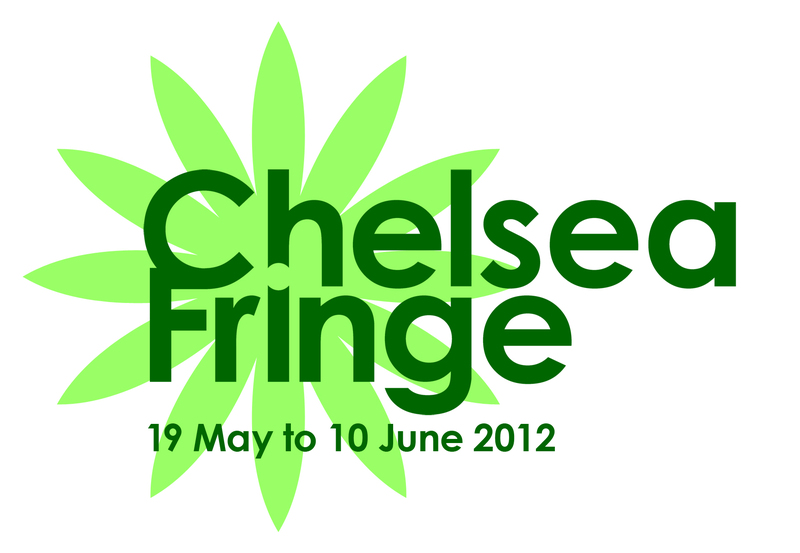 I popped down to the Chelsea Physic Garden recently to hear the marvellous Joy Larkcom talk about unusual veg. 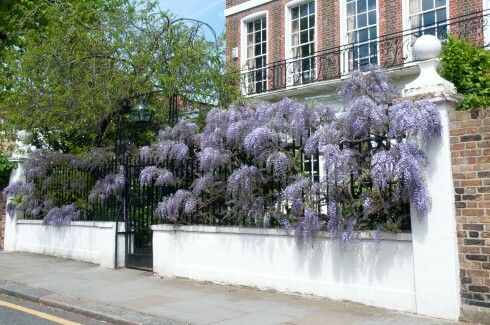 The talk was wonderful and inspiring (more about that soon in another post), but I just had to share a few pics of the glorious Wisterias adorning various walls and railings en route in SW3. Take the purple panicles pushing through the railings above. Who wouldn’t want such a magnificent hedge? And I take my hat off to the gardener who manages to keep the ivy at bay on the front of this house. 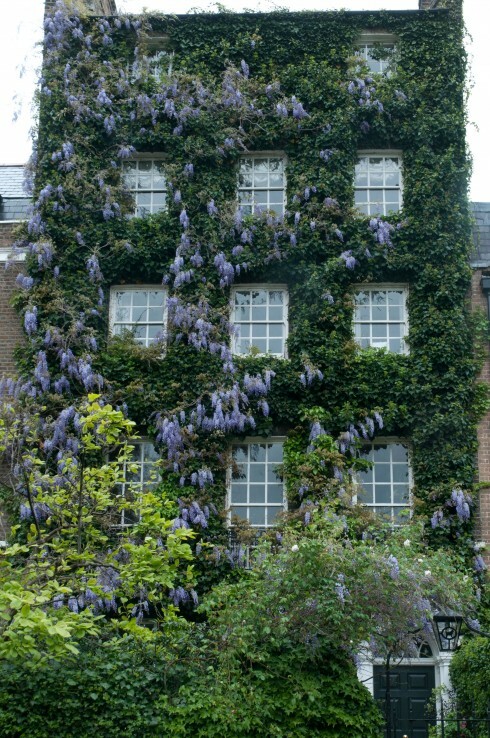 I’ve never been one for heights and this creeper must need regular pruning to give the Wisteria a fighting chance to flower each year. Some of the plants growing up these houses seem to be springing out of the foundations from the lightwell in the basement, but I also love the way this trunk artfully swings its way towards the bricks and mortar from further afield. And even though you can’t see the full glory of the Wisteria here, you still get the benefit of the delicious scent as you wander by. Marvellous. 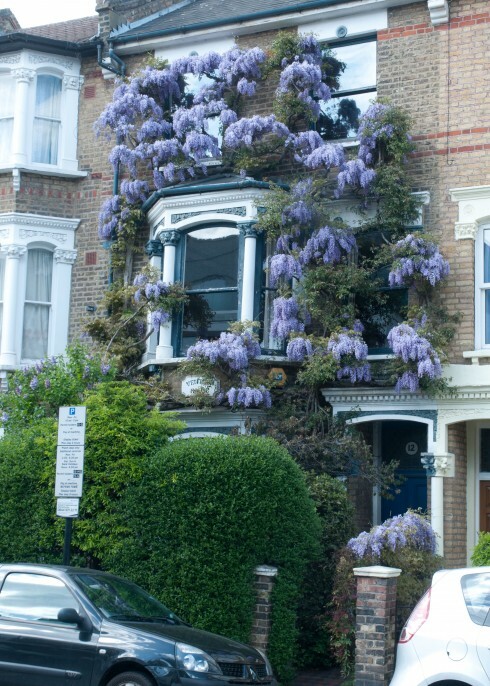 Here’s a few more Wisterias that I pass by regularly (not always with a camera) on my journeys closer to home in North London. I’ve admired of theses beautiful twisted trunks and flowers for the last few years. Same street, different house (notice different coloured door) and slightly different training. Equally gorgeous. And just around the corner from where I live. And lastly on the same street, this very elegant display. Love ’em all. 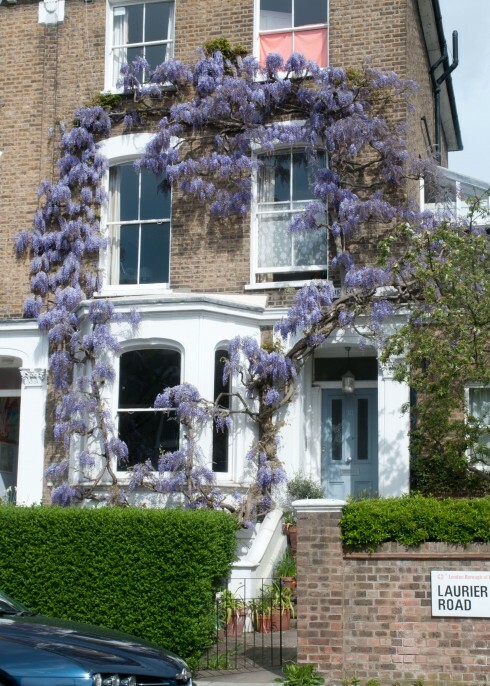 P.P.S Have a look a Veronica’s wisteria sighting in Lambeth! What fabulous blooms, here in Wiltshire my wisteria is still very much in bud, your photos remind me of what I’ve got to look forward to! Hi Mavina, I think I’ve caught the earliest blooms with plenty more to come. Have seen a few more in N. London today and will add a couple more pics to the post. beautiful! so much nice than last year – they all seemed a bit washed out after all the rain we had. Hi Colin, Yes, have seen fantastic specimens everywhere I go this year. And it looks sunny and warm out ? 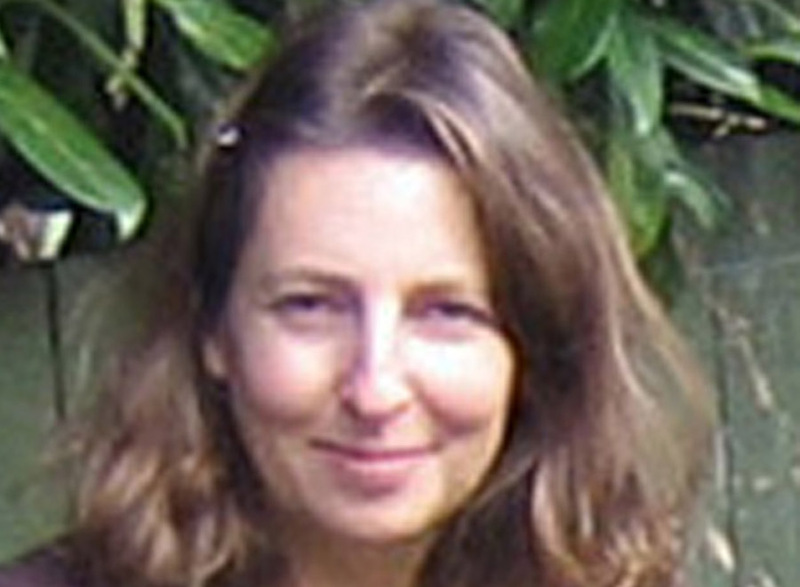 Are you going to the Rory McEwan exhibit at Kew ? Beautiful photos! I can’t wait for the day when I can have a house covered in it! Hi LBJ, Yes, I know what you mean. Should get planting one this year too. 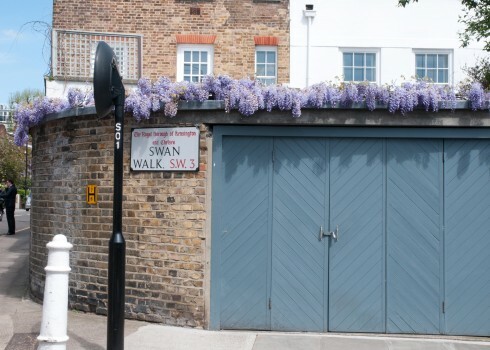 They’re gorgeous – although I agree with you about that virginia creeper! Hi Veronica, Sorry to outblog you on the Wisteria posts. 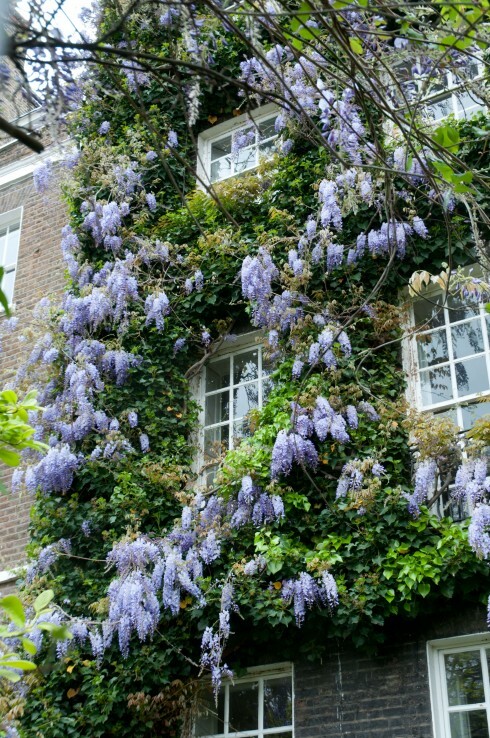 Must say though that the Wisteria you espied in Lambeth certainly does give Chelsea a run for its money! I wish I had seen this earlier this week as I saw a set of about 10 different wisterias growing up a building in a botanical garden in France on Wednesday and it was quite astonishing, much like your third picture. I am sorry now I didn’t photograph it for a bloggers wisteria theme. Oh well! 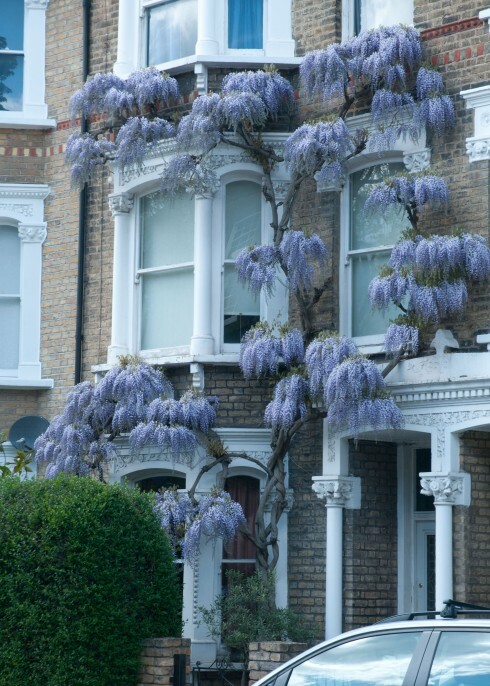 I love wisteria growing up these style of houses, so elegant. Hi Claire-would have loved to see what these Parisien Wisterias looked like! 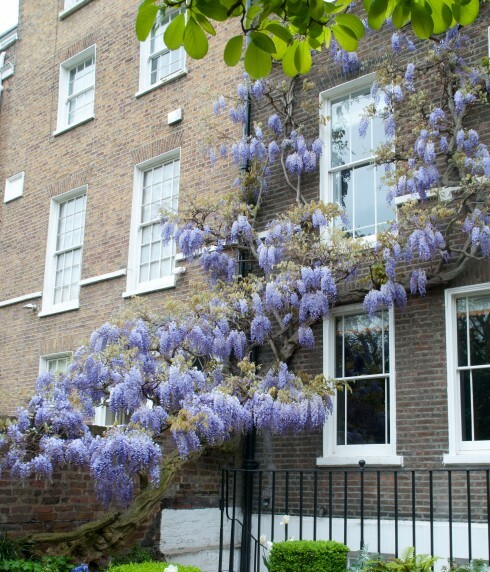 I’m starting to really feel the need for some elegant Wisteria climbing up our own house! Lovely post! 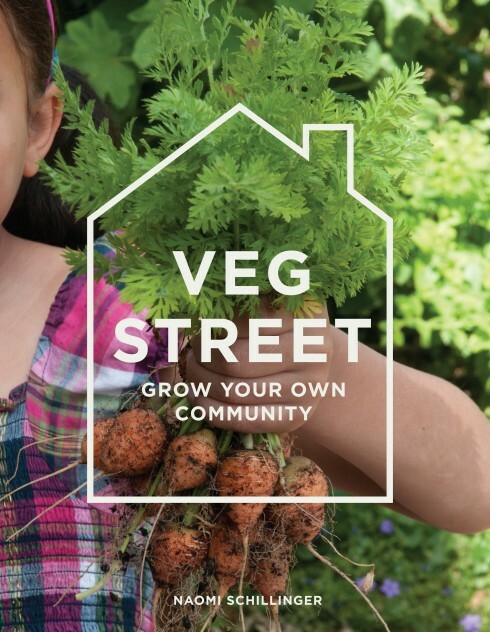 Those photos are wonderful — I recognise a couple of them from when I lived in South London and from time-to-time found myself in Chelsea. 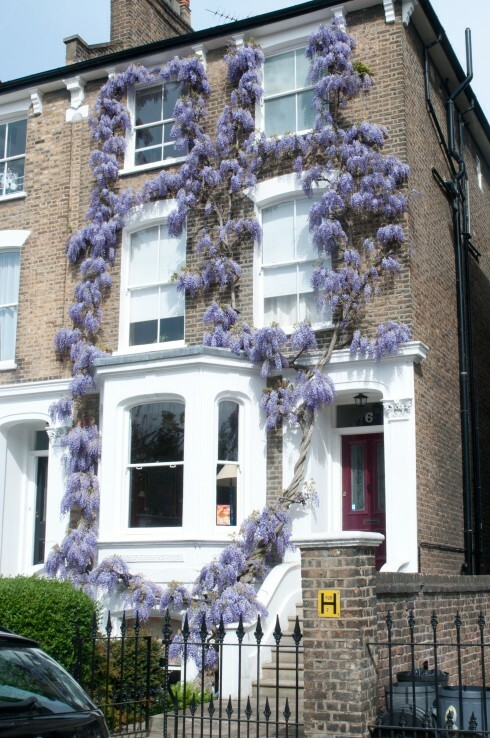 Funny to re-experience my wisteria-envy at such a distance!